There is one thing you can count on when training for endurance sports: it will never go exactly as planned. There will be interruptions and snags along the way. Sometimes this is devastating, and sometimes it opens the door for a breakthrough. The good news is, these temporary pauses in our training offer time to refocus, evaluate our progress, and reenergize for the challenges still ahead. This is also a time where our support system becomes a difference maker. Will our training circumstances drag us down and leave us short of our goals? Or will it fuel us with a new head of steam towards pushing through and leaving the speed bumps in the dust? Personally, I appreciate family and friends who remember my goals and encourage me along the way. 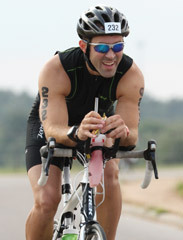 Specifically, they consider my time commitments and efforts towards the Ironman in November. They remind me of my purpose. They know my timeline and ask about my training. A thoughtful word or question can always spark my motivation towards making tomorrow's workout the best it can be. I am grateful for friends on a similar journey. These are the ones who motivate me without knowing. Their Strava posts and social media celebrations of success spur me on. They anxiously await an opportunity to relate to my struggles and celebrate my triumphs. Furthermore, I am indebted to the professionals. Namely, I am thankful for the wise folks of Schlegel Bicycles who set me up for success and are readily available to advise, suggest, or tweak any part of my training or equipment. They understand that having the right equipment and knowledge at the right place and time is a game changer. Having the forward progress of our training halted is never fun, but it happens to all of us. We have a choice. It can leave us feeling discouraged and unmotivated, or with the help of our strongest supporters, it can leave us compelled and anxious to return steadfast and finish strong.